Pleasant Manor is a quaint four storey walk-up in a lovely residential neighbourhood in midtown Toronto that surrounds a vibrant stretch of restaurants, cafés, and boutique shops. The building in popular Mount Pleasant, offers 13 studios and 15 1 bedroom apartments for rent, a welcome addition to Hollyburn’s growing rental community. Hollyburn’s most recent acquisition, on the corner of Mount Pleasant and Millwood Road, features spacious suites with beautiful oak hardwood floors and double pane windows. There are several transit options (TTC bus stops, Eglinton subway station) directly outside of the building, making the entire city accessible from this prime location. 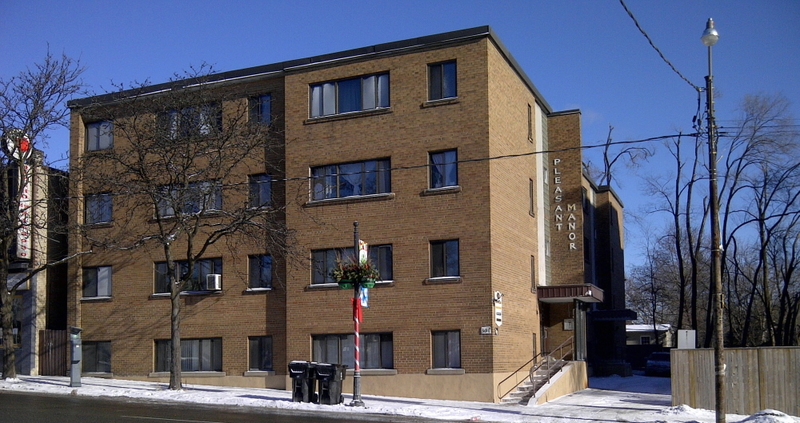 The building is situated across the street from the Davisville Tennis Club and within a two block vicinity to both Hodgson Senior Public School and Manor Montessori School. The area is teeming with eclectic specialty stores, including cupcake shops, chocolateries and bookstores, giving the neighbourhood and undeniable charm. Two independent cinemas, The Regent and the Mt. Pleasant, add art and culture to the magic of the area. We look forward to introducing ourselves to the existing residents and to offering the same professionalism, quality, service and commitment to building management and maintenance as we strive to be recognized for across our national portfolio. For more details, please take a look at our building page. Suite and interior pictures coming soon!